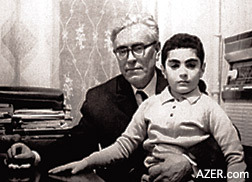 Left: Dr. Aghakhan Aghabeyli with his grandson now Dr. Farid Alakbarli, the author of this article. Basically, Stalin had a deep quarrel with geneticists and, as a result, many of them were imprisoned or even shot. According to Communist ideology there was no such thing as superior genes. These illusions were promulgated by Soviet scientist T.D.Lisenko, who convinced Stalin that he and his colleagues could develop new productive breeds of animals and plants based on Marxist-Leninist theory. Lisenko insisted that Mendel and Morgan were capitalists and had created false deterministic theories about genes and chromosomes to disprove that the human race could be changed by special training and ideology. Lisenko countered by saying that genes and chromosomes had nothing to do with heredity. His theory was very primitive and asserted, for example, that if a cow were well fed and healthy, this would enable the offspring to be fat and productive. Good soil, ample watering, good agricultural techniques were sufficient enough for developing new breeds. Long-termed biological selection based on genes and chromosomes was not necessary. For Lisenko, selectionists and geneticists were liars, anti-soviet capitalists and "Enemies of the People". In this way, Lisenko sought to rid himself of competitors - the famous Soviet geneticists. Famous Soviet geneticists such as Professors Vavilov, Koltsov, Serebrovski and others followed the scientific approach and were branded as Mendelists-Morganists. They scoffed at Lisenko's primitive ideas, calling him "the clown of science", "crazy", and "ignorant". Little did they realize how dangerous it was to be so critical of him. Nobody believed that a time would come when he would garner enough power to terrify all geneticists in the USSR. Above Left: T.D. Lisenko (smirking in center) surrounded by a group of scientists, including some of his opponents and some of the former students of Serebrovski who was killed by Stalin. Note the portrait of Stalin. Professor Aghakhan Aghabeyli (first from left). Above Right: Aghabeyli in 1931 as a PhD student in Moscow (third from right). First from left was his professor (wearing beret), the world-reknown geneticist Professor Serebrovski who was shot by Stalin later in the 1930s. By gaining favor with Stalin, Lisenko gained control of all agricultural science throughout the country, including all scientific institutions, universities and laboratories related to biology, genetics and agriculture. Stalin embraced the ideas of Lisenko and it wasn't long before he had Serebrovski and Koltsov shot to death. Vavilov was imprisoned and died of dysentery. Hundreds of other genuine geneticists and selectionists suffered during the Repression as well [especially during the year 1937]. Nor did Dr. Aghabeyli escape censure. As a former student of Serebrovski, he had published a book in 1933 entitled, "A Short Course in the Genetics of Animals". This was the first genetics text that had ever been prepared in the Azerbaijani language. It consisted of a compilation of lectures that Aghabeyli had given at Ganja Agricultural University. In 1937, the KGB questioned Aghabeyli, accusing him of having written a Mendelist-Morganist book which was branded as "anti-Soviet" and of collaborating with Professor Serebrovski, who was known to be an "Enemy of the People". The KGB warned Aghabeyli not to give any more lectures based on Mendelist-Morganist theories. They threatened that if he disobeyed, he would be arrested immediately. And so it was that up until Stalin's death in 1953, Professor Aghabeyli along with many other Soviet geneticists were not allowed to say a single word about the scientific role of genes or chromosomes for fear of being arrested. Dr. Farid Alakbarli is the grandson of Dr. Aghabeyli. Farid works at the Institute of Manuscripts in Baku and has two doctorate degrees - one in Historical Sciences and the other in Biology. His own specialty is medieval medical manuscripts in the Arabic script. To read about the life and scientific contributions of Dr. Aghabeyli's wife, Khadija Aghabeyli, see "Pre-Soviet Era - Growing Up in Baku's Old City" (AI 12.3, Autumn 2004). Search at AZER.com.